After collecting your products' info and photos you should organize them in categories. The better you organize them the easier your visitors will navigate your store. 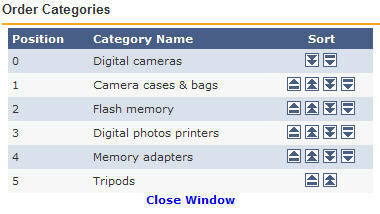 In order to do so, go to the Category Editor page by clicking "Catalog > Categories". Figure: Setup a category by choosing "Catalog > Categories" in the Administration Panel. You can use this page either to edit an existing category or to create a new root category (a category with no parent). For adding a new root category, type its name in the text box and click "Add Category". If you had wanted to edit an existing category you would simply choose the category from the "Edit Category" drop down menu. 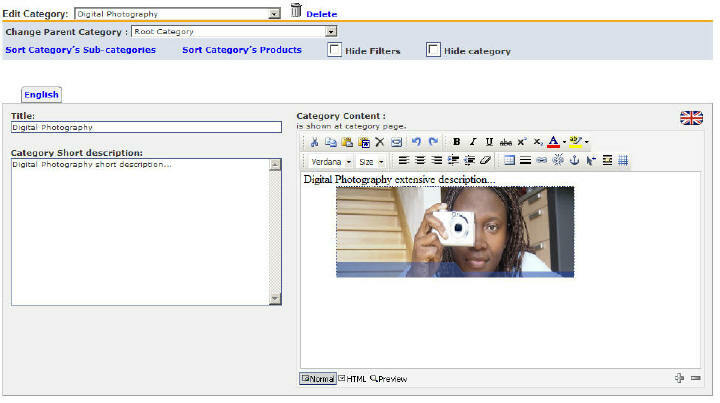 Figure: Adding the root category "Digital Photography". 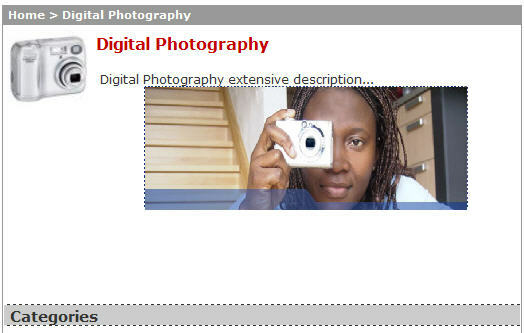 You are now transferred to the category editor page for the "Digital Photography" root category. Here you can define the category's details and add images and subcategories to it. A form for editing the category's details (parent category, title, description etc.) is provided at the top of the category editor page. Figure: Editing the "Digital Photography" category. Delete: The option of deleting the category is given by pressing the "Delete" link. Change Parent Directory: You can also change the parent directory by choosing a different one from the "Change Parent Category " drop menu. This of course applies to the case where the category you are editing is a sub-category. Figure: Changing the order of the sub-categories found in the Digital Photography category. Figure: Changing the order of the products found in the "Digital Photography>>>Tripods" final category. Figure: Storefront: Hiding the filters from the "Digital Photography" category page. Figure: Storefront: Keeping the filters in the "Digital Photography>Digital Cameras" subcategory page. Hide Category: You can choose to hide the category if you wish to keep it unavailable for a length of time. Title: Add the category title. Category Content: Add the category content that will appear in the category's main page. The category content editor has all major functionalities of a powerful text editor and will let you paste files, process the text etc. Category Short description: Add a short description for the category. This will appear in category listing pages. Use this form to upload an image for the category. Figure: Adding a picture for the "Digital Photography" category. Type the image pathname or use the "Browse..." button to upload the image for your category. Once the image is uploaded, it will show up in the "thumbnail photo" section. If you wish to change the image used for a category, click on the "Update Image" button to delete the existing image and upload a new one using the "Browse..." button. Once all the fields have been edited accordingly, click on the "Update Category" button to add the changes to your store front. 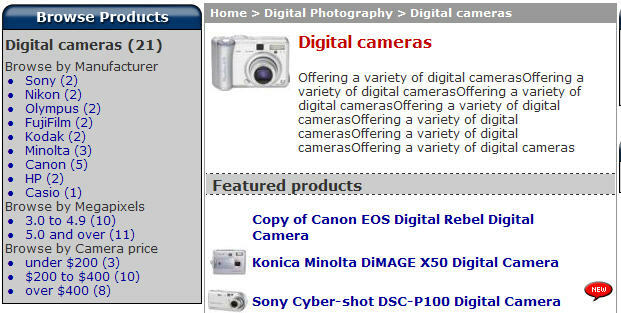 Figure: Storefront page of the "Digital Photography" category. Figure: Adding the "cini cameras" sub category to the "Digital Photography" category. Simply type the "Subcategory Title" in the text box provided and use the "Add Category" button to add the defined subcategory. Choose "Setup > Categories" in the administration panel to create a new root category or edit an existing one. Once in the category edition page, you can add a title, long and short description for your category, change the parent directory and the order of the sub-categories and products listed under the category, add an image and sub-categories etc. There is always the option of deleting the current category by use of the "Delete" button. Once all the changes are done click the "Update Category" button to update the category in the e-commerce storefront.